Wild West flavor, the rugged outdoors, romantic places to stay, and sunny skies all combine to make Arizona a terrific destination for romantic vacations and honeymoons in the Southwest USA. And the night skies in Southern Arizona are some of the clearest in all of continental USA – perfect for romantic star gazing! 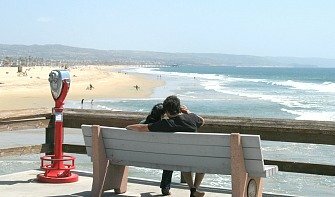 Best Time for Romantic Travel to Arizona - Arizona can get oppressively hot from June to August, so Autumn and Spring are excellent times to go. Northern Arizona & the Grand Canyon can be inaccessible during winter months (snow & ice) so plan accordingly. 3. Take a Hike in the Desert - the Phoenix/Scottsdale area has numerous areas ideal for short walks through the cactus and desert foliage. The Piestewa Peak Recreation Area (2701 E. Squaw Peak Dr, Phoenix AZ) is one option, and if you're up to a shorter (mile or so) but steeper climb, the Summit Trail will reward you with very nice sunset views at the top. 5. Enjoy a View with your Romantic Dinner - how about a nice dinner with drinks and scenic views of the Valley? A couple possibilities are the Alchemy Restaurant at CopperWynd Resort and Club (13225 N Eagle Ridge Dr, Fountain Hills AZ 480-333-1880) and the Different Pointe of View at the Pointe Hilton Tapatio Cliffs (11111 North 7th St, Phoenix AZ 602-866-6350). Scottsdale Arizona Top 5 Romantic Resorts & Hotels - Excellent Romantic Vacations feature reviews of 5 of the most romantic places for couples to stay in Scottsdale AZ, including the Scott Resort & Spa. 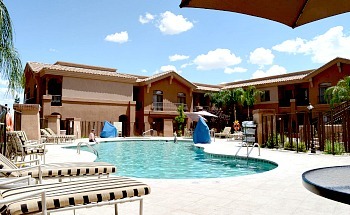 Hot Deals on Romantic Phoenix Hotels & Resorts - deep discounts on some of the best accommodation for couples, including Pointe Hilton Tapatio Cliffs Resort, Hotel Palomar Phoenix, and the Royal Palms Resort & Spa. 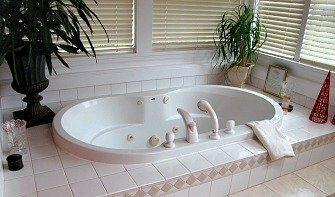 Arizona's Best Hot Tub & Whirlpool Suite Hotel Rooms - book a getaway or honeymoon in a romantic & inexpensive suite with a jetted spa tub in Arizona's most attractive destinations. No mention of Arizona romantic getaways would be complete without Sedona. If you're sick of crowds, crave some solace, and don't mind spending a bit more to get it, this romantic destination in North-Central Arizona is for you. It's also become known as a real spa destination, and Red Rock State Park (just a 10 minute drive from town) with it's unforgettable sunsets gets our vote as one of the best places to propose in Arizona. 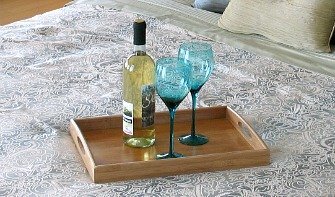 Romantic Sedona AZ Cabins - for an affordable B&B getaway in Arizona, these cabins and luxury rentals come already to enjoy with a variety of amenities, including Whirlpool spa tubs, hammocks, private decks and wood-burning fireplaces. Couple Exploring the Streets of Old Tucson, AZ. Tucson is one of the most interesting Southern Arizona romantic getaways. You can feel the "Old Southwest" a lot closer to the surface here than other destinations in Arizona, and just a few miles out of town are horseback riding, wilderness hikes and one of the best re-created Wild West towns in the West. Tucson, Arizona Romantic Hotel & Resort Deals - romantic stays at Tucson hotels for less, including the Westin La Paloma, Loews Ventana Canyon and Hilton Tucson East. Grand Canyon Cabin Rentals – many of these romantic cabin rentals in North Central Arizona close to the Grand Canyon National Park offer relaxing luxury amenities like fireplace, Wi-Fi, private decks, hot tub and much more. 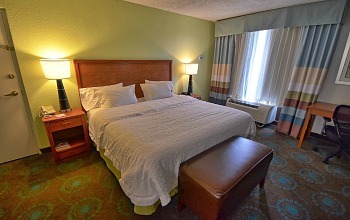 Rates are affordable, and you can enjoy the seclusion while being close to hiking & biking trails, and scenic views. 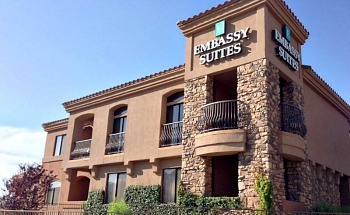 Lake Havasu City is a worthwhile stop while vacationing in Southern Arizona. The lake here is home to all kinds of outdoor activities on and beside the water, and the city has some good dining spots as well. Make sure to include some time around the waterfront area underneath London Bridge, with it's shops and attractions. 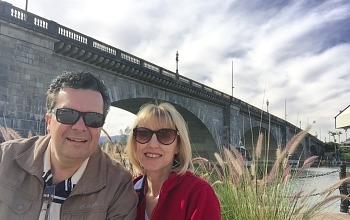 Good to Remember: Spring Break brings many people to Lake Havasu each year in March, so for a quiet getaway, choose another month (like February, which we did). Las Vegas Romantic Vacation Ideas - discover Vegas beyond the casinos for couples, including the most romantic hotels and resorts on the Strip as well fun things to see and do. 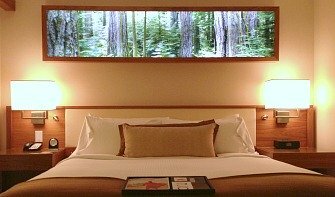 Colorado Romantic Travel Ideas & Deals - great tips on getaways in Denver, Colorado Springs, the Rockies and more. Bisbee, AZ – a romantic destination in southeastern Arizona, Bisbee offers a step back in time with it’s narrow lanes, Victorian-style galleries and cafes, as well as the Brewery Gulch saloon. Monument Valley - take a romantic Arizona road trip through this scenic piece of classic Southwest landscape between Arizona & Utah on US Route 163. Grand Canyon, AZ - a top attraction for Arizona romantic getaways! Stops of interest for couples include the North Rim's Vista Encontada (nice picnic spot) and Lipan Point on the South Rim for it's great views and gorgeous sunsets.